My sister is back from Spain! 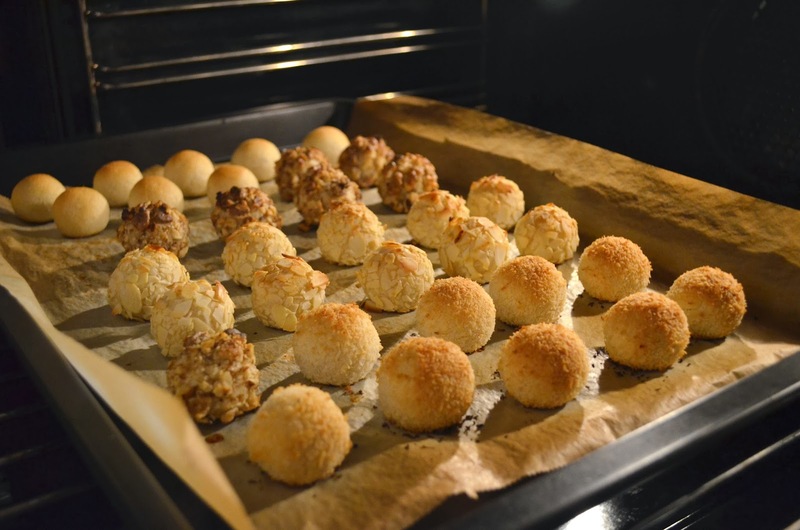 And she brought with her a recipe for me: Panellets. Her colleague had given her the recipe after she tried them once and she loved it! And after baking and tasting, I'm going to have to agree with her. 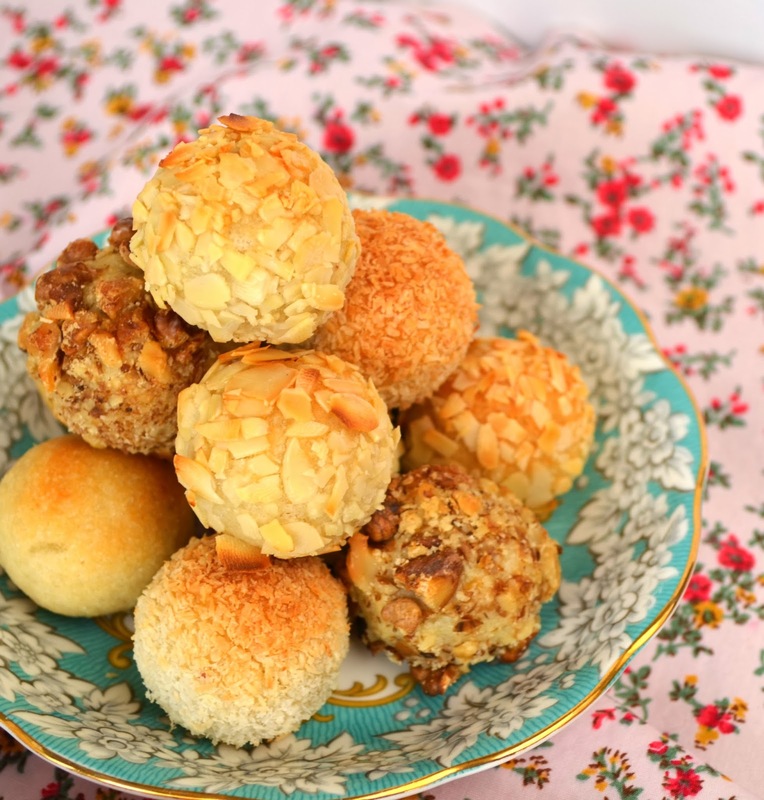 Panellets are small baked marzipan-like balls covered in a topping. They are a traditional treat of Catalonia (a part of Spain) on Castanyada, or All Saints day. Its celebrated either on 31st of October or the 1st of November. I can't seem to figure out which one it really is and I don't actually know any Spanish people I could ask, but we could both agree that its definitely not October nor November right now. But it's never too late or early to start eating anything that involves almonds. So let's just skip to the recipe! No wait, I have more to say! Pine nuts as topping are most traditional. You'll find almond or coconut as well, but you can use practically anything. My sister talked about chocolate panellets as well. I haven't tried these, but you can try adding a spoon cocoa powder and tell me how it turns out? 1. Skin the potatoes and cook them until they turn soft. Drain and mash very finely in a bowl. Leave to cool. 2. Whisk the sugar and almonds together and knead in the sweet potato (and vanilla/lemon) until you get the consistency of a cookie dough. Wrap this in foil and leave in the fridge for several hours or overnight. 3. Roll the dough into small balls the size of eyeballs (yes, don't think about it too much). If you want them to be almost exactly the same size, weighing them works: mine were 17-20 grams each. 4. Roll the balls into egg white and leave to sit for a few seconds so they can get wet and soak up the liquid. 5. Roll them into your topping of choice. 6. Bake them at 200 degrees Celsius or 400 degrees Fahrenheit until golden brown. This should take no longer than 10 minutes. Leave to cool before eating and store in an air-tight container. A lot of recipes for panellets use egg yolk. So the recipe from my sisters colleague seemed very odd, since it is so different from the rest. I have actually tried 3 different recipes before sharing you this one. The other two that included a whole egg or just the yolks, ended up deflating. I mean, you could roll perfect balls but when they're in the oven they turn into near-flat cookies. So I've scratched the egg yolks, and went for the original recipe from a person I've never actually met who lives all the way in Spain and makes this every year. I decided I like the recipe a lot more that way. Who would prefer using a recipe from the internet or from a book when you can have something that has been handed down from mother to daughter and has accidentally found its way to you? Somehow it feels more real this way. Does anyone else have any recipes they heard of from a friends friend? Or a sister's colleague? How did that turn out for you? Dear sister's Spanish colleague, thank you so much for the recipe! I hope I didn't disappoint you! These look super interesting, I have never seen anything like them! I love almonds and sweet potatoes though so I am sure I would love these as well. Thanks Mallory! I had never heard of these myself until my sister had brought them from Barcelona. They're definitely worth trying! How interesting! Love reading about traditional goodies from different countries. So these taste like marzipan? Can't believe they are made with sweet potato! Panforte di Siena - oh yes it's Christmas season!